What do you do for fun? Perhaps going out for a movie? Or maybe a dip in the pool? For the animals of Carolina Tiger Rescue, fun comes in the form of new platforms, fun scents, and so much more! All of these items and activities are part of our enrichment program. Enrichment is anything that is added to an animal’s habitat that stimulates their senses or promotes natural behaviors. The picture at the top of the page is of Rajah destroying his paper mache giraffe. 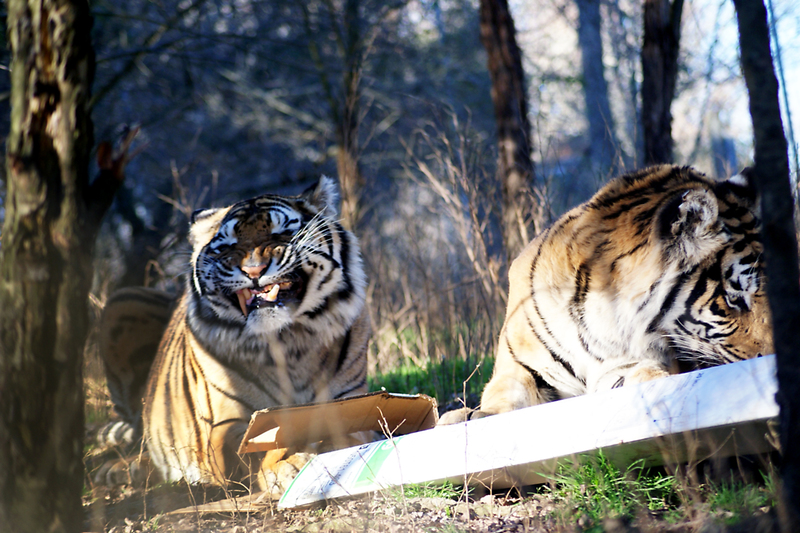 Fenimore and Emerson Tiger play with a cardboard box sprayed with smelly perfume. 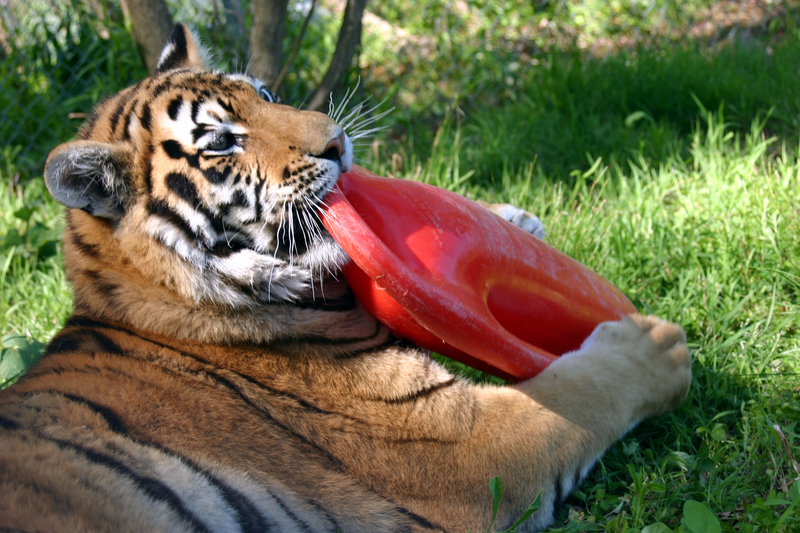 Kaela Tiger plays with a hard plastic toy. 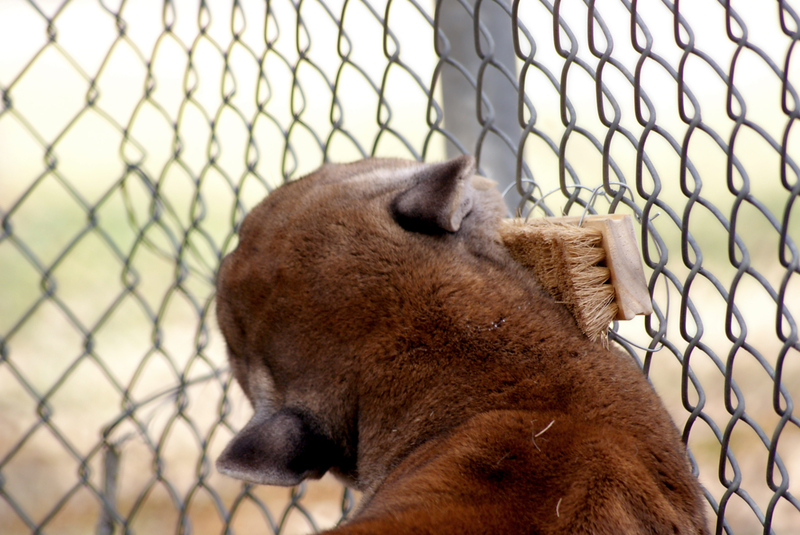 Nakobi Cougar rubbing on a natural bristle brush. Smell is very important to the animals. When they encounter a new smell, they will often rub their face and body on it. If they find the smell really interesting, they may display the flehmen response (it looks like a cross between a smile and a grimace). The flehman response enables the animals to better interpret the scent. The animals have a tremendous amount of fun playing with new toys. This can be anything from hard plastic toys that are specially designed to withstand the power of wild animals, to metal beer kegs, to bowling balls. All of these items offer different textures, smells, and movement for the cats. Different textures encourage grooming behaviors in the animals. Natural bristle brushes and sisal rope attached to poles allow the animals to get those hard-to-reach places! Grooming is a good way for an animal to reduce stress and keep their coat looking shiny and clean. Beautiful! Hobie Serval has to dig to get to his food. To keep the animals on their toes, the keepers will sometimes hide their food. They may scatter their food in their habitats or use boxes and other toys to make it just a little more challenging for the animals to find their food. In the wild, the animals would have to work hard to get their next meal. This extra effort helps keep their brains engaged and thinking! It’s important to take into consideration an animal’s natural inclinations when choosing an enrichment activity for them. Tigers are one of the few cats that really enjoy playing in water. All of our tigers have access to pools. Sometimes they like to get really crazy and bring toys into their pools. Kegs and plastic toys will bob and float in the water. It’s great fun to try to sink them! Fenimore Tiger plays in his pool. 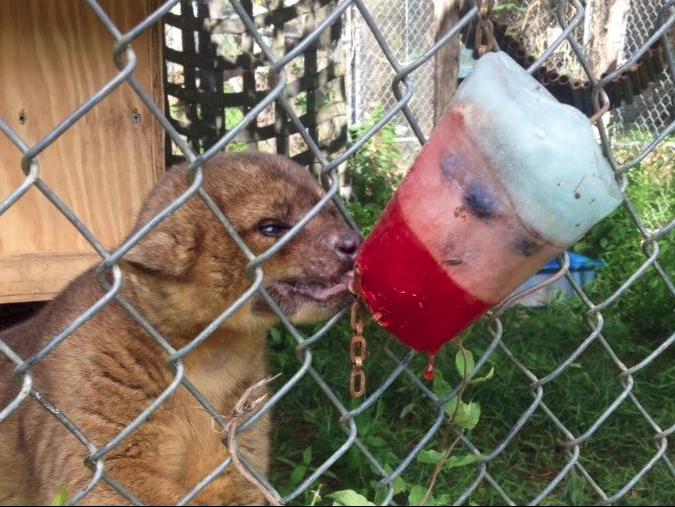 Albert Kinkajou enjoys a cold treat on a hot day! Nakobi Cougar checks out his strange new neighbor. 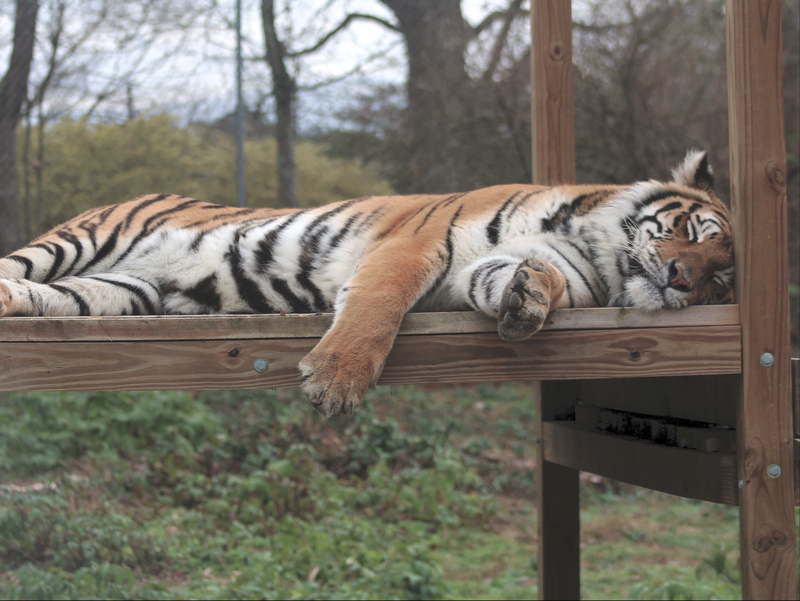 Carolina Tiger takes advantage of a platform to steal a quick nap! Delivering their food in unique ways can also be very entertaining for the animals, particularly when the weather is not inviting. Cold popsicles and warm apples can be a much-appreciated change. Even changing from beef chunks to ground beef can make things more interesting. “Where did you come from?” Sometimes you may see our animal care staff and volunteers dressing up like strange characters. Though it may seem silly to us, seeing something new and different can be very exciting and engaging for the animals. While the animals may not always “play” with their platforms, they are an additional type of enrichment. Platforms allow the animals to lay on something different and take in a different view of their surroundings. They will sometimes even use the platforms to hide from other animals or to spy on their neighbors! Before Madonna's big move on Tuesday, she got some pretty special enrichment from her Adoptive Parents, Beth and Mike! They built Madonna her very own beach paradise right in the middle of North Carolina. She had a beautiful sandcastle filled with meat, and a lush palm tree to scratch on. This is just one of the many examples of amazing enrichment that our animals' Adoptive Parents provide for them. They are always going above and beyond! Thank you to all of our wonderful Adoptive Parents, and to Beth and Mike for sharing their photos and video with us! Madonna Tiger breaks into her sandcastle to find her meal. Many of our staff and volunteers love to build items for the animals to destroy. We always use animal friendly products (no tape, only non-toxic paint, etc.) so that they can feel free to express themselves however they would like. Themes are popular (think summer vacation or Halloween) and meals are often hidden inside. Whether it is a sandcastle or a giraffe, the animals love tearing into their new toys! Enrichment is not only fun for the animals. Watching a favorite cat rip into a box or chase after a T. Rex is great fun. We want all of our animals to be happy and healthy. We are pleased that we are able to provide them so many fun things to keep them active and engaged.